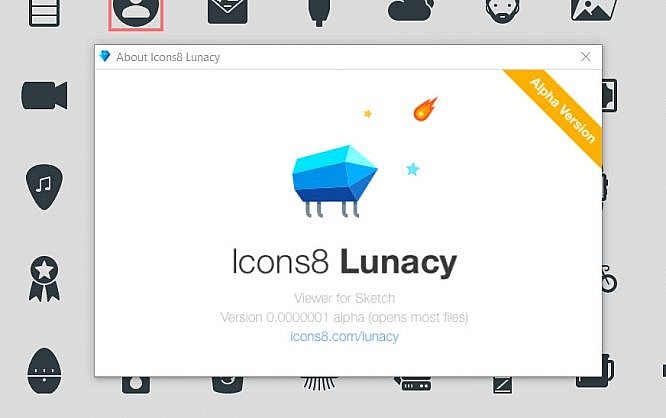 Lunacy is a Sketch file viewer made by pictogram factory Icons8. Lunacy runs smoothly while being completely free. There’s even a portable version. Sketch by Bohemian Coding is a vector editor that has become an everyday tool for many web developers, replacing Adobe Illustrator. The newcomer’s strong focus on web developer needs is likely to be the main reason for its popularity. The subscription constraint as placed by Adobe as a factor probably is not to be underestimated either. It could all be so easy if Sketch wasn’t available exclusively for macOS. This excludes a large share of the design community. The operators of the pictogram manufactory Icons8 did not want to accept that lack and created a viewer. Using this tool, called Lunacy, you can at least open Sketch files. Advanced features are already being developed. You can copy the CSS for individual objects, though. The same goes for text. As we can see from different comparison screenshots, the Icons8 team proves that display under Windows is very close to the macOS original. Differences are mostly based on the different display configuration of the two operating systems. Lunacy is a software that is available for free download and use. Keep in mind that this is an alpha version. In my tests, it crashed occasionally, but it worked correctly for the most part. When installing Lunacy on your Windows computer, you can directly associate the file extension .sketch with Lunacy. The installation is not necessarily required, however. Icons8 also provide a portable version that functions autonomously from within an Exe file. Icons8 have been a part of almost all of our symbol overviews here at Noupe, most recently, they were part of our Best of 2016 With 100 Free Icon Sets. Generally, the entire pictogram range of Icons8 is completely free to use as long as you can settle for a size limit of 100 x 100 pixels in the PNG file format, and if you are willing to properly link Icons8 every time. Other formats in all possible resolutions are exclusive to paying customers. Hi guys, thank you for the review about Lunacy!